Government of the Sindh has announced 261 New Government Jobs in Sukkur Municipal Corporation. Jobs titles and number of posts are as follows, Director Municipal Services 01 Vacancy, Driver 10 Vacancies and Sanitary Worker / Sweeper 250 Vacancies. 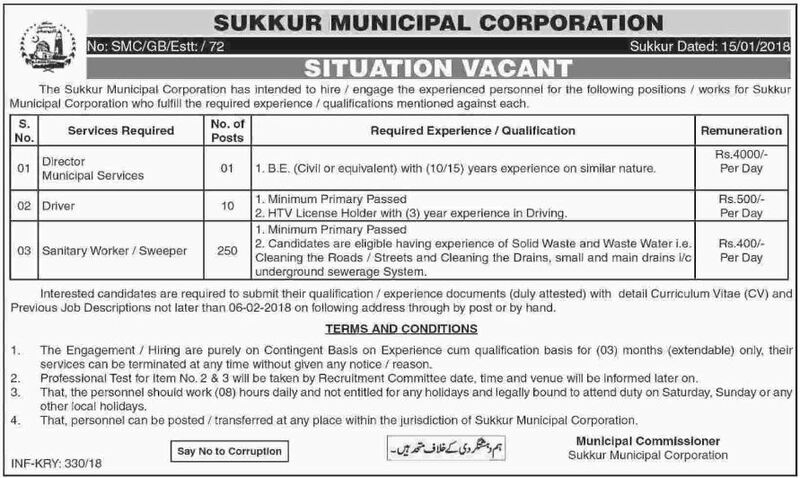 Interest Candidates are required to submit their qualification / experience documents (duly attested) with detail Curriculum Vitae to the office of Municipal Commissioner Sukkur Municipal Corporation before given date and time.